Deputy Registrar training takes place the 3rd Wednesday of every month at 3:00pm, until 2 months before an Election. Please contact the Elections office to make arrangements to attend the training session at 815-895-7183 or contact Lynne Kunde at lkunde@dekalbcounty.org. Deputy Registrars provide an important service to the electoral process for our community throughout the year. They must be a registered voter in DeKalb County, trained and certified through the DeKalb County Clerk’s office, Elections Division. 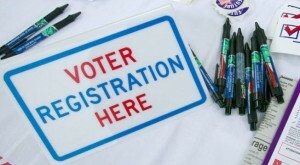 Once trained, a Registrar may register any Illinois resident, who qualifies to vote. A Deputy Registrar may not engage in any form of electioneering while registering voters; this includes, but is not limited to, working for or against a proposition, candidate or party. The following may be appointed as Deputy Registrars, upon written request to the Election’s office: chief librarian, school principal, labor organization members, bona fide state civic organization members, healthcare directors, family service agency directors, employment security director, and/or their designees. All elected and appointed Municipal, Township and Road District Clerks, Precinct Committeepersons or their designees are automatically eligible to become Deputy Registrars.